Why the Rugged Wrangler is Jeep’s Greatest Creation Ramble on with the classic Wrangler, which happens to be more popular than ever. Jeep has built its brand on the authenticity of its off-roaders. The rugged vehicles started as real-life Army equipment and in civilian life became peerless beasts that perform heroics on Nevada’s tortuous Rubicon Trail and the boulders of Moab, Utah. But the coolest part of a Jeep is its egalitarianism. Nearly anyone who can afford a new car can afford a Wrangler. The popular four-door Wrangler Unlimited starts at $27,295, which is well below the average $33,560 purchase price of a new car, according to Kelley Blue Book. And the Wrangler is having a moment: Jeep sales are up 23 percent compared with 2014, and the Wrangler breaks sales records every month. What’s the attraction? The Wrangler is the green plastic Army man writ large. Jeep’s Mopar parts division has a catalog of add-ons to make the Wrangler even cooler, tougher, and more personalized, and there’s an entire industry of other companies dedicated to the same cause. “The Wrangler may be the most customized vehicle in the world,” crows Jeep’s director of product marketing, Jim Morrison. And what about drivers who don’t have more money to spend after they buy their Wrangler? That’s easy, too: Owners can customize by taking parts away from the Jeep. Buy a throwback-style Wrangler Willys Wheeler Edition in tank-green paint or an Army-inspired Freedom Edition to start, then take off anything that wouldn’t have been there when Jeeps landed in Normandy, Busan, or Saigon. The roof comes right off. So do the doors. If you promise not to drive it on the street, you can fold down the windshield. The end caps even come off the bumpers, letting the meaty tires attack the terrain without any interference from the vehicle’s bodywork. Now you’ve got a serious off-road machine that truly looks the part. Jeep knows people love the Wrangler’s heritage, which is why it builds its own fantasies, like the Staff Car concept the company introduced at the 2015 Moab Easter Jeep Safari. The Staff Car is a four-door Wrangler Unlimited that has the middle door B pillar cut out, a retro canvas roof installed, and old-school 16-inch steel wheels, 35-inch Firestone NDT military tires, and a mounted vintage exterior gas can. The Staff Car even has a standard Wrangler 290-horsepower V-6 engine and six-speed manual transmission that lets you shift gears just like Granddad did, though Wranglers in the showroom also offer a five-speed automatic transmission. 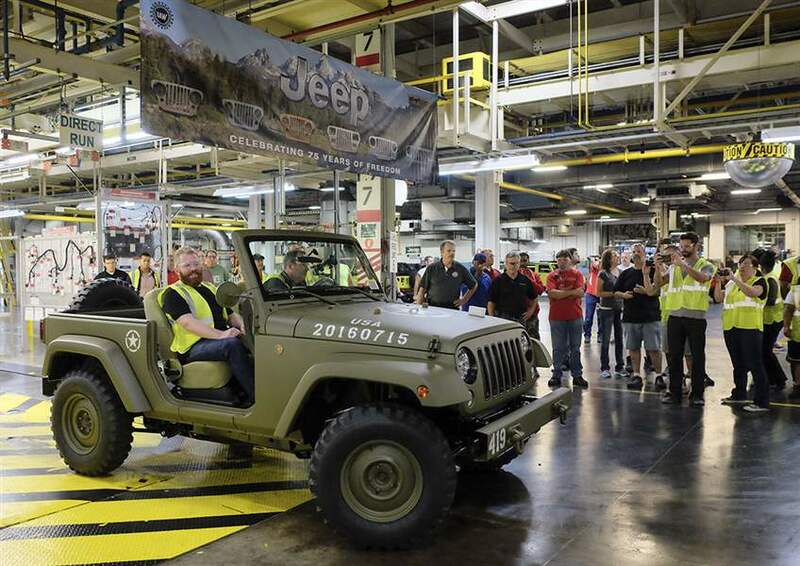 “It is a nice reflection of the people on the Jeep staff and our support for the brand’s military connection,” says Morrison.